Apart from clicking planes and buttons on the sidebar, the game has mouse and keyboard controls/shortcuts as well. Click on the scrollweel to press OK or handover. PageUp/Down for altitude, Arrow Up/Down for speed, Arrow Left/Right for heading, Insert for ILS and Enter to confirm. Type 'NOBAR' if you want to try and play the game without the sidebar. If you experience bugs or crashes, please send a crash report and/or mail me to look for a solution. Mail or leave a comment below. This program contains free software licensed under a number of licenses, including the GNU Lesser General Public License. More info on this page. www.flightradar24.com See how the professionals control the airspace IRL. www.liveatc.net It's fun to hear real life ATC communications while playing. www.skyvector.com Browse real life aeronautical maps. Wake turbulence distance is more clearly displayed to the user. Adjusted (increased) the traffic to secondary airports. The traffic flow to these airports depends on the skill value, but in the previous version the flow was pretty low even at high (20+) skill values. enable ILS mode by clicking left and right mouse button at the same time, scrollwheel functionality, etc. v3.9.5 solves an issue where android app failed to start when mouse moves during splash screen. Added low contrast option, to reduce display issues on certain monitors (VA, OLED) with slow black->grey transitions. When contrast setting is at '0', the black pixels will be actually dark grey pixels, improving display quality when panning/zooming. Enabled multiwindow support (android 7+) to allow for multitasking; could be useful on devices with large screens (tablets, chromebooks). App scales best in landscape dimensions, by design, because the options bar is on the side. Also added 64bit support on android, to anticipate to new Google Play store requirements (it shouldn't cause any noticable changes to the game, apart from a slight increase in app size). Wake turbulence distance is added to text at the bottom when mouse cursor hovers above a near plane (and on android: when multitouch is used on two planes). 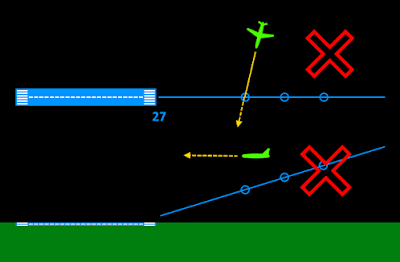 When hovering over a near plane, the bearing towards the plane is displayed. More departures from secondary airports when flow mode is enabled (after setting a high skill first). Flow limit increased to 180 planes per hour. Before it was limited at 120/h, but that may not be challenging enough when 3 landing runways are available (happens at KATL). However, departure flow is unlikely to keep up with very high flow numbers and will start to lag behind (a star will be shown to indicate this). Fixed keyboard command for speed adjustment for departures. Added more weight categories, totalling 6 (as in 'RECAT' used in some places in real life), for more efficient wake turbulence separation, both on the localizer and time between departures. Added occasional (rare) light traffic (labelled 'L') at several airports. Wake arc will adapt dynamically to the required distance between two plane categories (instead of always displaying two arcs for 'H' and 'M' categories). Planes inbound secondary airports will have a slightly different (mint) label color, so they're easier to distinguish from planes inbound to main airport. Bugfix where planes go missed approach at CYYZ + TZ when localizers were crossing eachother. 2 new locations! CYYZ and RJTT were added. Set traffic mode to custom to be able to set a skill value and skill cap yourself. The skill value will determine the amount of planes you have in your control at a time (and it opens more runways, and it determines the amount of traffic to secondary runways). Set traffic mode to 'flow' for a fixed flow of inbound and outbound traffic. For example, set it at 30 and you'll get 30 planes per hour departing, and 30 planes per hour arriving at the main airport. Added buttons for 'no departure' mode and 'no secondary traffic' mode. More display settings: range rings, and XL font (android). Change runway configuration (by tapping the RWY CHG button, or F12) without risking missed approaches. Can be handy if there's weather near a runway, or the wind has changed. After a runway change request, it takes a few minutes before new approach clearances can be given. Inactive runways are visible (in grey). Removed doubletap ILS for LLZ mode, as it could be to easily selected by accident. LLZ mode is now hidden behind a longpress between the altitude buttons. Android app targets Oreo and has an updated icon and full keyboard support. Better departure capacity from parallel runways. When selected, handed over planes still have the yellow target heading line visible. Hold right mouse button to show estimated time for the plane to reach cursor position. 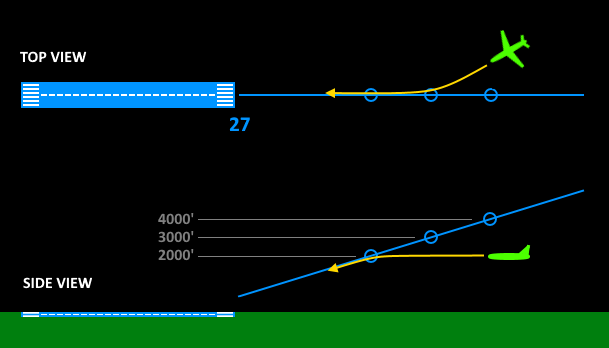 Adjusted transition altitudes for EGLL and EDDF. added L and R keyboard commands for left and right turns, H can still be used for shortest turn, and T is now used for headings after beacon. Paris (LFPG) has Orly (LFPO) as secondary airport, and flights over Paris city are only allowed at FL66 or higher. New York (KJFK) has Laguardia (KLGA) and Newark (KEWR) as 'secondary' airports (although they're quite busy), and all departures fly on a heading instead of the usual SID mode, so you'll need to enable SID manually at some point to clear them to their departure fix. Manual handoff of planes (optional). Move sidebar to the other side by doubletapping the menu button. Plane types are now visible in the infotext at the bottom of the screen. Share your stats via the button in the goals screen. In the PC version (see here, released on itch.io on 11 Dec 2015), restricted areas and multiple airports were added (Atlanta, London and Frankfurt). v2.8 Smaller font size / more help for beginners / several adjustments. v2.7 Added RD airport / more realistic separation rules / delays. v2.6 Changable font size / sound alerts. v2.5 Departures can now be vectored / various improvements. v2.4 Added pilot delay / various small tweaks. v2.3 Changes in separation requirements. v2.2 Added automatic save function. v2.1 Goals added / points scored per plane now depends on current score. v2.0 Skill cap function / new menu. v1.9 Pan view / cancel button / graphical changes. v1.8 Double tap to zoom / various small tweaks. v1.7 Zoom toggle button added / various small tweaks. v1.6 Label shows 3-letter code / bugfixes. v1.5 Bugfixes / changes to departure and arrival rate. v1.4 Fixed parallel ILS bug / departure rate now depends on skill value. v1.3 Fixed crash high dpi devices / various small tweaks. v1.1 Hints for beginners / bugfixes. v1.0 Released on Play Store on November 2, 2013. Just installed it, nice game! Thanks for posting! Hey -- I've been messing with this app for a few days and I love it. Most of the above I figured out on my own based on the on-screen tips. One thing I would wish for it is a more reliable way to save, exit, and resume -- sometimes when I suspend the app I can resume from where I left off, and sometimes it resets. Other than that, it's a blast and very well done. Thanks! Hi Rob. When pressing the back button while the game is paused, the game exits completely. When pressing the home, or when switching tasks, the game is paused and android keeps it in its memory until it the game is activated again. But when android runs out of memory, it automatically kills paused apps. A save game function would avoid this, but I haven't done this because its a lot of work (creating a function that writes everything to a file and one that loads it). So far I only store the high score value. I also made two other suggestions in my Google Play review which I'll mention here -- (1) a means of moving the command panel to the right side, so I can tap the buttons with my right hand (most of us are right-handed, after all) and not obscure the radar screen while doing it; and an option to limit the number of planes in control at once, so I can sit there mindlessly and truly enjoy "endless atc" instead of dealing with an ever-increasing level of sheer madness. All that being said, I appreciate the work you've done and it's a great product as-is. These are simply suggestions for further development, should you decide to invest the time and effort. Thanks for a truly enjoyable and well-conceived ATC app! As a former en route controller myself this was a lot of fun trying my hand at terminal. Keep up the great work. Been looking for a good tracon sim for a long time. Games are now saved! About STARs: as far as I know, on big airports planes are usually vectored to the ILS. On Schiphol for example, only at night hours complete STARs are flown. Hi again -- I have been VERY pleased to see that my suggestions for save-and-resume as well as capping the skill level have been incorporated. This is truly a five-star app -- nothing I've come across in the realm of ATC simulations online (for phones or PCs) has even come close. Thanks again for all of your hard work. I have been playing Endless ATC for about 5 or 6 weeks and I love it. I'm 77 and used to spend many hours a day watching TV. Now I watch a little TV and spend hours playing your game. I did encounter one problem the other night which I didn't understand. I was trying to land a KLM heavy flight but it kept making missed approaches. I put all other flights on hold and tried many combinations of speed and altitude(4000 ft and below) approaching the ILS from entry points between the altitude markers and above. Nothing seemed to work until by chance I made my approach from the other side of the ILS beam. That worked fine. Is this by design or just an anomaly? In any case I would love to see this game on my PC since it would be so much easier to see the plane info that is displayed next to the plane. My old eyes require a magnifying glass because I am using a smart phone since I do not own a tablet computer. It would be worth paying for the game to help cover the expense of your time and I would guess that you would get many new users. Another possibility would be to display the actual altitude and speed on the side panel to make it readable. Thanks again for a great game. Bert Horn tried to enter my name and url but I don't know what my required host name would be. Hi Bert, thanks for you comment. About the missed approach issue: it shouldn't matter from which side the plane intercepts the localizer. If it keeps missing approach, it's either a bug (please check for updates in the Play store), or the plane is flying too high to catch the glideslope. Try intercepting the localizer further away from the runway, for example at the 3000 or even 4000 feet marker, while flying at 2000 feet. Then it has more miles to stabilize on the localizer, so it can catch the glide later on when passing the 2000 feet marker. Is there a Windows PC Version avbl? Hi, a PC version is now available. This is a 4star game, it does what it says with a good degree of accuracy. But I've uninstalled it rather quickly for one reason: I was about to suffer RSI on high skill levels in order to keep things running. -The workload is too little (almost boring) at the beginning and becomes extremely high near the "end" (almost insane). -Airports are black holes, they "absorb" aircraft without letting them go ie too many arrivals, too little departures. -Controlling departures as well (besides altitude assignment) will be also interesting. -Nagging the player once when approaching a point and once more when entering a holding pattern is useless. What really interests real life controllers (especially when they get busy), is crossing the finals. And as far as I am concerned, if a controller forgets a plane without letting them know to "expect vector across finals", the plane will call the controller. Finally, when the TMA becomes crowded, more than one controllers could be in charge. For example, LGAV might occupy one departures controller (DEP) and up to 3 arrival controllers (ARR1, ARR2, ARR3), two intermediate and one final director. Could that be a multiplayer idea for the future? Hi Stelios, thanks for your feedback. I will consider some of the points you made for future updates. What started as a simple game has now become quite realistic. For some players it can't be realistic enough, while others play it more like a puzzle game, with increasing difficulty. And just to be sure: you can speed the game up (2x-4x) at the beginning, and later on limit the rate of arrivals for a more realistic workload using the cap option. Nothing public yet but I will try soon. About time speed yes I know but I totally missed cap so thanks for letting me know! I will be glad to see some of my recommendations implemented in one of your future releases. Once again, nice job, keep it up. Great game. Played and loved ATC2 simulator on the PC (uses voice commands) and this is the closest atc game that's most similar on android I've found. Cheers. what is critria for a diverted plane? thx. An arriving plane is diverted when when it leaves the airspace at the 30 nm boundary. A departing plane is diverted when it leaves the airspace at the boundary while flying at or below FL100. Hi, this is a great game, really well done. As far as I can tell, the runways are randomly generated, but the beacons are always in the same place. Therefore sometimes the beacons are in really unhelpful places. Is there any scope for having completely different setups with regards to this? Hi Liam. The layout is based on Schiphol airport. For the beacons, I use actual locations VOR/NDBs and some fixes found on charts online. Some runways have a locator too. The fixes near the perimeter are mostly used for departures. To avoid a cluttered screen, there are not too many fixes (only the most used ones). Headings should mainly be used the guide the traffic. Nice ATC Game ,is a PC Version exist ? The only thing i miss is a donate button. Amazon wish list maybe? Great game! One plane that took off made an emergeny-call and wanted to return to the airport. Does that just happen randomly and can a plane have an emergency when the skill-cap is on? Do you get extra skill level points by vectoring him bac quickly to land? Same amount as normal arrivals. Hi again! LOVE the updates. One small thing -- pilots inbound to Schiphol would not care nor report that they are crossing the EHRD loc. Thanks! Des this app work on thé Galaxy Tab 4? 'Coz I votre trouble when I'de like to ans were or guide thé aircrafts. Thanks to reply me quickly. I don't know, but if it works, you should directly see a radar screen with one or more planes on it. See the images above. Rob. I am pilot for a major airline. You have nailed it. Love the game. Question: When you have dual approaches running. You select an aircraft to land 18r ILS (he is coming from the west) . However, due to traffic you need him to switch to 18c. How do you reset the ILS for 18c. I tried reselecting ILS button, vectoring the plane to the east and vectoring him to 18c. However, I could not get him to change to 18c. He always indicated 18r. It really messed up my traffic flow. LOL. OTHER USERS. I am scoring in the 25.0 level. Are you doing better? Techniques? Answer: a plane is assigned to the nearest runway he's pointing at when you enable ILS and press OK. This makes it easy to play the game, however it's indeed a bit tricky to assign planes coming from the west to the eastward runway. You could disable the ILS clearance (and press OK), let the plane pass the localizer of 18R, then enable ILS again somewhere between the localizers to assign it to 18C. Best practice though, is to avoid this situation by balancing the amount of traffic evenly earlier on, for example by dividing traffic from the southwest between 18R (right hand circuit) and 18C (left hand circuit after SPL). So, I have found that when you select ILS. The plane must be below the ILS feather line, to capture that ILS. 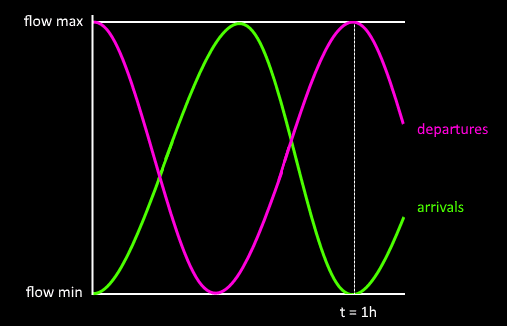 Example: 18R and 18C are active . A plane is being vectored from the EAST to 18c. If you look at the 18R extended line. (It is higher than 18c because of the runway offset). If the vectored Plane is above the 18C extends line and you select ILS. It will always capture the 18R ILS course. So, it would be nice if you could somehow override this and tell the aircraft which ILS you would like it to capture. This issue is now solved by an update. Before, when you wanted to give approach clearence for 18C from the east, while being far from the runway, then the plane would be abeam the 18R localizer first. Hence the ILS for 18R was selected before the desired 18C ILS was detected. From now on, the ILS can be detected further out from the runway, so even when the plane is not yet near/abeam the localizer. This makes selecting the correct runway more predictable. A truly amazing game. Congratulations on a job very well done. I'm a pilot and really missed an accurate ATC game for Android, you nailed it. Awesome game, i am spending a lot of time on it... 2 questions... 1) what us the high-score of the "experts" here..... 2) I get the comment "is delayed.... what does that mean? what did i do wrong? When a plane hasn't landed within about 30 minutes after entering the airspace, it's classified as delayed. So to keep flawless, the player also has to be time efficient. At high traffic rates that's pretty hard. Anonymous, I'm curious about high scores too. The best I've managed is 21 or so - after that run out of time and space to control all the aircraft, and start to have separation incidents. The Endurance III goal is the last one to get. If people are going higher it would be great to see some video of how they manage that. complement to question 2: I get "[callsign] is delayed" sometimes when there is a lot of traffic. Great game! I have been using it and enjoying it for a long time. But with the new update, I noticed the hold button for aicraft is missing. May we please have it back? The 'hold' button next to the 'ILS' button was a bit too prominent, considering that holding planes inside of the simulated airspace is very rare, let alone holding at any position. In real life, there's a published holding at SPY, but it's seldom used. On the other hand, it seems some player would like having the option to hold anywhere back, so maybe it will return in the future in some way. Holding a plane at it's current position is now possible by longpressing the DCT button. startgrid, many thanks for a very enjoyable game. I'd love to donate via some mechanism other than bitcoin, have you ever considered Paypal or similar ? The usual layout at Schiphol makes for lots of variation, but adding other airports would a be great addition. The interaction between Schiphol and Rotterdam can be fun, so maybe San Francisco with San Jose and/or Oakland would also work. Thanks. A bitcoin address was an easy addition. For now I created a PC version, allowing donation via Paypal also. Possibly at some point... Nice score! I understand the H at the end of a callsign means heavy, but what is the N? I also see a *F on a callsign. What is that? The numbers and letter(s) in the callsign are random and have no meaning, but the letter after the groundspeed means either medium or heavy. Are you a ATC or just a game developer? Developer with connections to actual ATC. Why do landing at some run way it says wrong airport? How to recognize correct runway? One runway, namely '24RD', is located at a different airport. Some planes have an 'RD' tag (see image above), which means they must land at '24RD' and not some runway on the main airport. Planes without the additional RD tag must land at the main aiport. this is the best atc game I have ever seen! love it! Love the game!! Can you please do an Atlanta Hartsfield-Jackson airport or Chicago O'Hare layout? Thanks! Maybe eventually, but I can't give a roadmap. Well..I'd like to say, that I'm really impressed! I'm about to graduate University of civil aviation soon and finely become an air traffic controller, so I do know something about this things. So, it's really amazing! I've installed this game for about 2 years ago and I'm not going to delete it because it's very cool. I have a question also. What about prohibited areas? Are you going to add some? I may add areas in the future, as long as it doesn't get too complicated/cluttered on small screens. How does the text to speech output work? For now, this is for the PC version only. In the menu, set sound mode to 2 or 3 and it should work. Update. It now changes voice automatically. For best results, both US and UK language packs (Windows) should be installed. And now voices are also added on android. To change the voices, see the android TTS settings for the UK and US languages. I understand. The plan is to bring it also to android in some way, yes. Can you say how long it will take until the update will be released for android? It's amazing! I love the game after the update. Thank you very much for programming this game. I think the price is very fair, it could even be a little bit more expensive. I love London the most, because there are 4 different airports and the airspace are very clear. Atlanta is very challenging in my opinion. Frankfurt is nice as well. I am looking forward for more improvements and maybe even more airports?! Forgott to mention a bug I noticed. Sometimes it happens, that two planes on parallel localicers have a sepperation incident even when they are handed over to tower. I am not quite sure weather it's a bug or weather I am doing something wrong, but it's very annoying. Nice feedback! About the possible bug: planes on different localizers should indeed never trigger an incident. Maybe in your case one plane was not (yet) nicely stabilized on the loc, but still turning? Otherwise, let me know the runway combo and I'll doublecheck. Not removed, but they only go around if they get more than one mile under the minima, to have some margin. Thanks for the suggestion. Now, the amount of traffic to RD is indeed quite low (like in real life). For London the amount is a bit higher. The traffic rate is proportional to the current skill value. I like the PC version, except I found that there is not a "Reset" option to reset the game. Please correct this as soon as you can. Thank you, David B. When you click on an airport in the menu, a new game is started, unless 'cap' mode is enabled AND you select the same airport: in that case, only the runway configuration is changed. To reset, disable cap or click on a different airport first. On the Android version I got a plane with an Engine Failure, but it had not ILS option. How should I handle that? Wait until the pilots are ready for approach. ILS option should appear after a couple of minutes. If the game is updated, you need to reinstall the game? To update, download it and overwrite the old files. Alternatively, if you use the itch.io app, it updates automatically. Can you add San Francisco and Munich please? Hi! I really love your game! Thanks for this! There's a little issue in Atlanta (I think). Sometimes, two planes arrive from the same location, one at level 110 and the other at 120. The last one keeps at 120 no matter what a do! It really refuses to go down. After a while, it says goodbye and I lose comm with it. Could it be a "inspector" seeing if I'm doing crap things (lol)? Again, thanks for you great job in this game. Thanks for your report! This issue was fixed last week, so please redownload the game and try again. Endless ATC in my opinion is the best ATC game out there,but i tink there`s an issue at Frankfurt.Planes come from the north,while at the real airport they don`t.Can you fix this, please? Sure :) I'll make adjustments to EDDF to make less likely for planes to arrive frome the north. To be included in a future update. Merci! Mail me if you want to try an older version. Hey! Very good game, I just purchased the new Android full version! Is there any plan to have custom zoom level? Or a further level, at least, it is very crowded at times. Hey, thanks! Yep, that is planned for a future update. Sometimes it is difficult to see whether an aircraft is Heavy or Super because it is directly above/below another aircraft. I suggest that when an aircraft is selected, populate the display near the top left of the screen (below score) with the info about the selected aircraft. Agreed, I'll make improvements on label visibility in a next update. Really love this game, will there be any ios or macos version in the future? Also it will be nice if the map is a bit bigger. Thank you! ios/mac is unlikely. Thanks for the suggestion. Awesome game, just purchased the Android version. Thanks. That notation could also be used. I chose to use the current notation to show the minimum altitude in areas, for all planes ('X') or special planes ('tag'). For example 25/LC says the ceiling of the tower zone at London City is at 2500 feet. Are there any plans for the future of Endless ACT ? I think it would be very nice to have more airports available. For example San Francisco( whole bay area?) Or New York with all 3 airports? Hello. Yes, more locations are likely. Thank you. I have played both version on android and steam. Is this possible for you to add the 'new' button to the PC version? As i can't find this thing in the game. It would be nice if you can start from zero again if you make a mess in the game. Hi. If you select an airport, a new game is started. Yes, maybe this would be more clear if there was a dedicated button. really love this game, I play it since the first release but you reallty should add STAR on the simulator. I mean, it's true that in busy airport vectors are needed. But just at final moments for sequence, before they usually stay under RNAV STAR (like in Roma Fiumicino). When, on the game, you have 25 aircraft under vectors it's just crazy! Hi Davide, thanks for your input. Indeed, the game is limited to vectors and ILS approaches, while in real life there are more options. This makes the game easier to pick up and control, and it's still pretty close to real life operations (for example, at Schiphol all planes in the terminal airspace get vectors, except at night when it's quiet, only then RNAV transitions are used). But this may differ per facility. In any case, 25 aircraft is very busy, that would IRL require more controllers on different frequencies. Anyway, I'll keep your suggestion in mind, but I also like to keep the game simple! Hello, I´m Alonso i have 16 years and i live in spain. For planes on the ILS, it is quite hard to determine the position of the arc that indicates the minimum separation behind a heavy/super aircraft when it gets busy. Although it is still visible if I zoom in, it waste time to do it. My suggestion is to have the arc 'glow' yellow if the plane is on the ILS and it is tap by the player so that the arc can be more visible. Agreed, I'll change the color to make it better visible. Thank you for the update, really love the yellow arc. It make me play much more efficiently (especially at KATL with score>25). Een super simulatie! Simpele interface en super realistisch. Ik durf het bijna niet te zeggen (want het is al vaak gezegd) dat ik het een goed idee vindt om STARS toe te voegen. Inderdaad irl gaat het via vectoring, maar het zou wel fijn zijn als de kisten via de transitions de sector binnenkomen, dus via RIVER en SUGOL etc. Geeft net iets meer structuur op de inbounds. Dank je! The traffic enters (more or less) via one of the three fixes, like IRL. 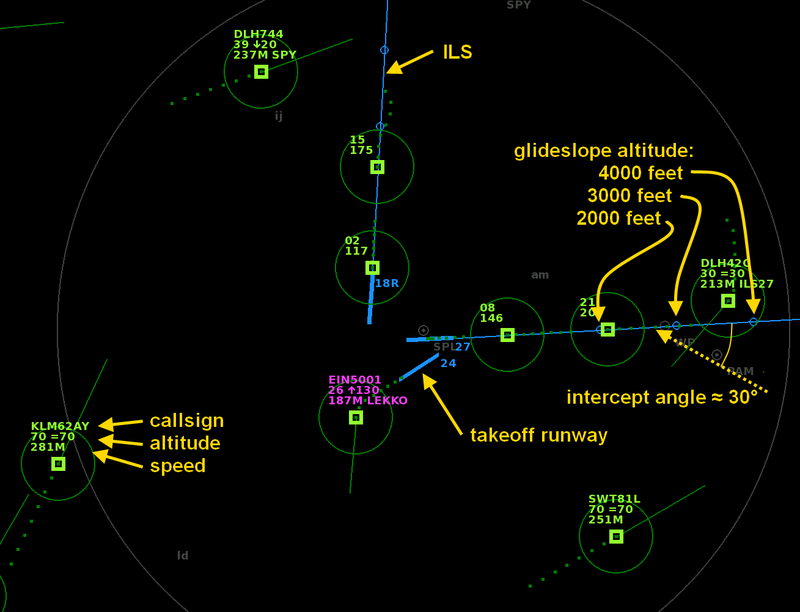 Only approach control is simulated here; the three fixes/holdings are therefore located just outside of the airspace. But for the London area I decided to zoom out a bit more to add the four initial fixes/holding stacks to the controlled airspace. I played Endless ATC. It is really nice! I'm Japanese, want to spread this game thinking in Japan. and I maked tutorial movie. Two virtual newsreader girls explain about basic rules. That is the best ATC simulation that I ever played. I'll be cheering you on ! Nice video, well done! I think you explained the game very clearly for new players! Thanks a lot for the support! I tried Endless ATC V3.5. and there are some questions. 2. After boot, Appear airplanes when first pause. but second or later, no appear airplanes in pause. and screen slide to right under. is it some function like screen saver...? I need to update Japanese manual. I'd appreciate it if you could teach me that. 1. Not really, but you can use the L or R command without giving a heading to make a 360 turn. Works if a plane is not already in a turn. 2. Indeed, the pause screen was changed, so now you can have a look at the radar while taking a break. When pausing again later, the planes will not appear; the idea for this is that repeatedly using the pause function cannot be used as an 'exploit' to slow the game down/make it easier. However if this feels inconsistent to players I may revert it. Thank you for answer my questions. I added description in Japanese manual. I continue cheer new players and you ! I find Endless ATC really good! However since the last update I can't reset the game, it just picks up from where I left off. How can I solve this? If you click on the selected airport button, the game resets. Thx! Yes, I've tried that but it continues on all airports, it doesn't reset at all. Perhaps I should re-install? Shouldn't be necessary. What happens exactly when you repeatedly click on the EHAM button, for example? Here it just restarts on every click. So what happens is that I start the session for let's say EDDF and it builds up to a certain level, let's say 20 and at that point I exit the game. Next time I start the game it continues at the point where I quit. Before, if I wanted to re-start the scenario and start all over again, all I had to do was to select different airport, and then again switch back to EDDF and scenario would start from scratch. But now, that doesn't happen! It doesn't reset on any airport but keeps remembering each position for each airport. I've tried re-installing the game via steam but that doesn't help, strangely!? That's as intended; switching airports doesn't reset anymore, allowing you to play different airports without having to start over each time you switch. But resetting should still happen when you press current airport button again. So pressing EDDF twice should always make it start from scratch. Otherwise, something is wrong! The use of emergency separation is described in ICAO Doc 4444, 15.7.1." Came across this paragraph a while ago, don't know if this is something you would like to implement? Sure, it's only a small change that doesn't affect normal gameplay. Hello, is there any chance to have a IOS version? No, I don't have the knowledge and hardware to do that, unfortunately. Hi. I'm really enjoying your game and have purchased the full version for Android. You've done a great job on it! One small issue I have is that I play on my Galaxy S8+ and it has rounded corners on the screen. I've noticed that the game doesn't take account of the rounded corners and so the text on the screen gets cut off. Could you please adjust the game to recognise rounded corners and adjust the display of text accordingly? The planes missed approach because runway changed. Could this be avoid? I didn't notice any prompts though. Yep, in the latest version this should not happen anymore; planes will continue their approach, even if the runway is not active anymore. I've notice that planes that are coming from US/CAN and Ireland sometimes arrive from the east at Lam and Big which Irl it doesn't. They would arrive from the West at Bnn and Ock so could that be fixed in a future update. Planes that are flying from Europe will arrive via Big and Lam, planes from asia only use lam. Also planes that are coming from the West to Ock also flys direct from the left of Ock and not from the south. Also with egll cpt sid 09r departures the plane goes left instead of right which is what they do irl so hopefully that can be changed but for now I just vector them to the right so it does cause problems with the plane arriving from the left. i think you should look up flightradar24 and see the different approaches and where each airline comes in from because in the simulation i see planes that are suppose to be flying from europe flying from the west via bnn/ock when they should be arriving from the east. same thing for the departure,airlines like delta and american shouldnt be flying east. Whats the diffrence between ils and ils*? How does LLZ help in 3 parallel rwy situations? Give an example. Any plans to add KLAX airport? Very well done. Would be interesting to see Santiago Airport (SCEL) in this sim, because of the Andes mountains. Inbound aircraft assigned a waypoint/fix how do you know which airport they are destined for? Thank you! If you use Steam or Play, updates are automatic, but if you use itch.io you can download and overwrite the files if a newer version is published. Hi, can you add SAEZ/EZE (Buenos Aires Ministro Pistarini Intl. Airport) and SBGR/GRU (Sao Paolo Guarulhos Intl. Airport)? Because this airports are the most importante of latín América and SÁEZ has 2 sec airports and SBGR also 2! And the y are 2 very excitante airports. I would love this game if you add this airports!!! Thank you very much! Please increase separation circle for heavies. I vector extremely close and without a visual barrier I end of giving way too much space. It's maddening to be working on a 100 or 200 error free landings only too hear a missed approach due to following too close. A little arc is displayed behind heavies to show the required distance, but I'll try to make it more clear in a future version. Hovering with the mouse shows the exact distance in the infotext line. Press ESC to pause (on android, press the back button). To reset, go the the airport menu and press the current airport again. When will next update be?